The first year I grew flowers, my cutting garden was a delightful jungle of flowers and waist high weeds. While I loved the process of selecting varieties, planting, tending and picking I hadn’t anticipated just how much energy would be used battling weeds to ensure a healthy and abundant harvest. The following spring, determined to have a more successful experience, I borrowed a thousand dollars from my Mom and ordered enough landscape fabric to cover my barely half acre plot. While it was a huge investment, it was the only way I could see being able to manage the weeds, wrangle our two small children and grow my budding little business. That spring, Chris burned close to 15,000 holes in landscape fabric and I finally had a thriving and relatively weed free garden. A lot has changed since then, both the kids and the garden have grown rapidly, but that initial batch of landscape fabric is still in use and has been added to each season. While weed suppression is our main reason for using landscape fabric, there are a few additional benefits worth noting. 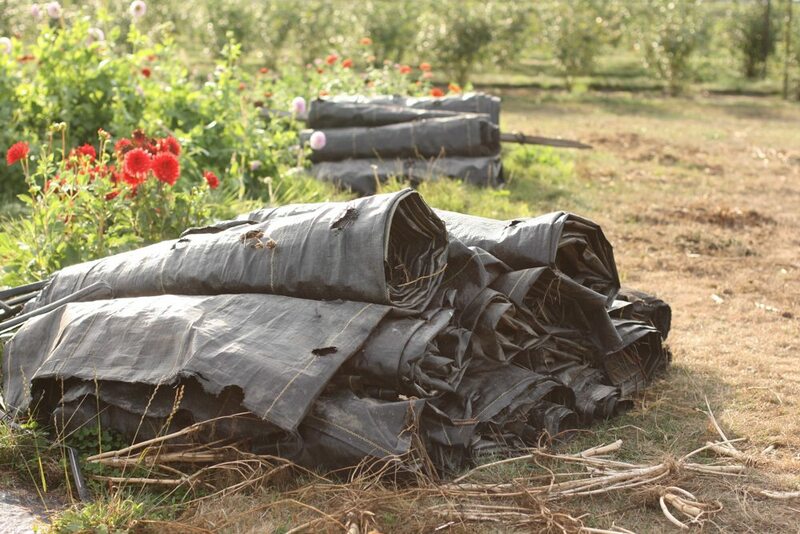 Unlike plastic, landscape fabric is reusable. The majority of our stock is in its tenth season and shows little to no wear. I’ve also inherited a batch of pre-burned fabric from a retired flower farmer that dates back to the early 90’s and is still in pretty good shape, considering the age. I am hopeful that ours will last for 20+ years too. Things like zinnias, celosia, cosmos and basil which like warmer soil and added heat thrive when planted into the fabric. And moisture retention seems to be greatly increased with the use of fabric. Another great bonus is that fabric makes for a tidy, clean looking garden. Proper plant spacing is a snap when the holes are already preset. Lastly, weed pressure is greatly decreased. We generally only have to do two early rounds of weeding on the fabric beds before they can coast for the rest of the season untended. Compared to the typical four or five rounds of weeding needed on our open field crops, the cost of the fabric quickly pays for itself in saved labor. Sunbelt is the brand of landscape fabric we always buy, but if you can’t find it locally, Johnny’s Selected Seeds carries some too. It is shiny on both sides (avoid the type with a fuzzy bottom), is super durable and comes in a number of different lengths and widths. 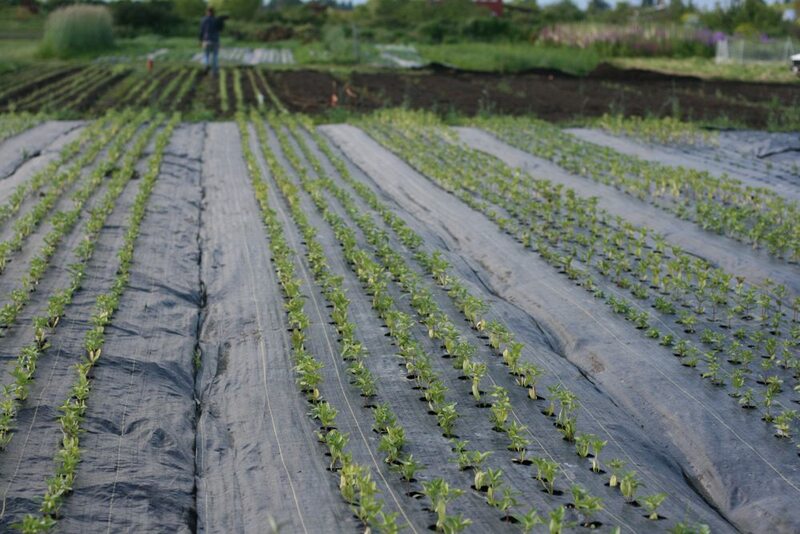 We prefer the 6 foot wide x 300 foot long rolls which allows four feet for the growing bed and if overlapped with another swath of fabric, it provides a weed-free path in between the beds, which is just wide enough to get down for planting, weeding and harvesting. It’s important that the holes in the landscape fabric are burned, not cut. We highly recommend using a handheld Bernzomatic TS4000 Trigger Start Torch attachment which screws onto a 14 ounce disposable propane canister, available at your local hardware store. One canister will last a long time and the automatic trigger switch, while more expensive than the flint lit version, will pay for itself in no time. For perfect spacing and increased efficiency, you will need to use some type of template. In the early years I made them out of cardboard and lined the holes with tin foil. It worked pretty well for a short while, but they didn’t hold up over the long haul. I’ve had friends make them out of plywood, but I’d recommend you stay away from this option since plywood is really heavy to pull along if you have a lot of fabric to burn. The best option is to use a template made out of metal. You can make your own with supplies from the hardware store including a 2″ hole drill and sheet metal. It’s a bit of a project but metal is the lightest and longest lasting option. If making your own template feels too daunting, we have fabric burning templates available in the Floret Shop. These ultra durable, easy to use templates were custom made to the exact specifications that we use here on the farm. They can be shipped anywhere in the continental United States. These fabric burning templates are a total game changer when it comes to using landscape fabric because they allow you to perfectly space each hole quickly and efficiently, saving you so many hours of work. 6×6” spacing = 7 rows per bed. This ultra tight spacing is great for single-stemmed crops like lisianthus, flowering cabbage and Bombay celosia. 9×9” spacing = 5 rows per bed. This is by far our most popular spacing, making up about 80% of our field and is perfect for dianthus, zinnias, basil, frosted explosion grass, snapdragons, ageratum, bupleurum and honeywort. 12×12” spacing = 4 rows per bed. This spacing is perfect for bulky varieties like bells of Ireland, celosia, amaranth, scented geranium, perilla and lavatera. 18x 18” spacing = 3 rows per bed. This spacing works for really large plants like branching sunflowers and eucalyptus. Vine spacing, 8” between plants and 12” between rows = 2 rows per bed, one on each side of the trellis. This spacing is perfect for sweet peas, nasturtiums, love in puff and hyacinth bean. 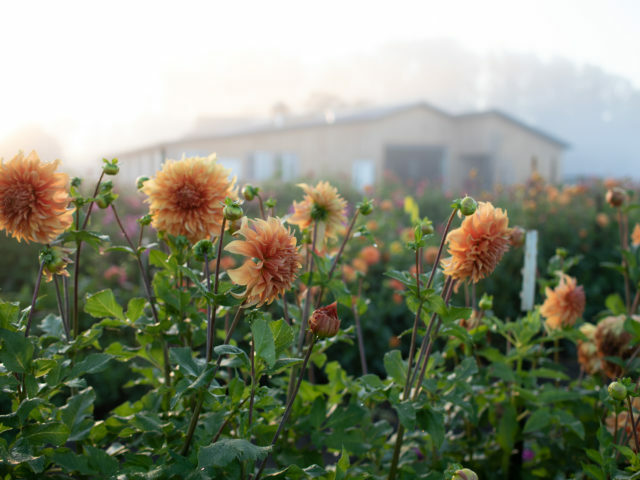 Dahlia spacing, 12″ between plants and 18″ between rows = 2 rows per bed. We grow our dahlias intensively, with 2 rows per bed. In past years we’ve burned the fabric outdoors because the fumes are pretty strong, but when wind free days are scarce in the spring, we sometimes have to move the project inside. Our garage has a large concrete floor and plenty of big doors that can be rolled open for good ventilation. With music going and someone to help move the template, we are able to burn a 300 foot roll of fabric in about an hour and a half. 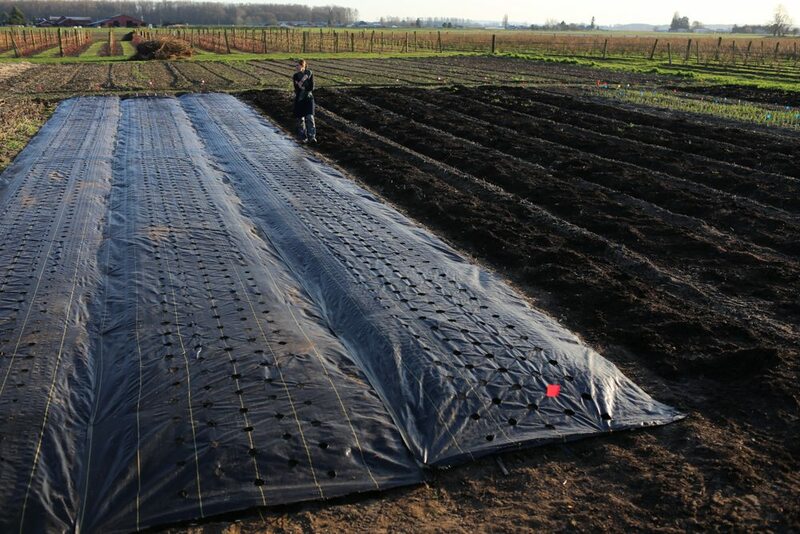 Before laying the fabric, beds are amended with compost and fertilizer, then lightly tilled and given four lines of drip irrigation each. You can get the full scoop about how we prepare planting beds in my post about soil preparation. After the soil has been amended and drip irrigation is in place, the fabric is then rolled out over the beds and irrigation lines, and anchored in place with earth staples. During the earliest months of spring, we get a lot of intense wind storms (gusts of up to 40-60 mph) that roll through our valley. To keep newly laid fabric in place during really breezy weather, we place cinder blocks along the pathways. Once the weather has calmed we take them up and store them away. Seedlings are then tucked into the holes with our favorite planting tool, a butter knife. Nothing does the job better! Newly planted babies are given a light overhead watering, a long drip irrigation soaking and then are left to do their thing. We come through a few times with compost tea and then as the plants grow add a layer or two of Hortonova flower netting for support. After the crop has been harvested, we remove the netting, mow the remaining foliage down with either our brush hog set a foot above the ground, or with a weedwhacker. We then chain the ends of the fabric to our tractor bucket and pull it up. But before we had a tractor, it was all done by hand. After the fabric is removed, we shake off the excess dirt, fold it up and store it away for the next season. While using landscape fabric is certainly more labor intensive on the front and back end of the season vs. straight field planting, we’ve found that the added weed suppression and perfect preset plant spacing far outweigh the drawbacks. Do you use fabric for bulbs as well? I’m thinking of planting some, but I’m planting in the fall and I worry about their growth and spread overtime? Should I not use fabric? Hi Jessica– no, we do not use fabric with bulbs. Have a great season! How are the plastics stored? Folded or rolled up on something like conduit or PVC? Also, you said you chain them up to tractor to pull out — what tools/attachments do you use. I have major weeds and grass growing through the holes. How do you weed 10,000 holes?? And not pull the seedlings too? Preventative? Preen or something? I have your book and love it!! It has inspired me so much and I have it close by always! Thankyou for your time and effort in teaching others. Can you tell me if it is to late to plant Lisisanthus and Larkspur in my zone 6 ? Also I have Cheif series celosia in plug trays that have already started to bloom. Can I cut them way back and still plant them out? We planted so many varieties you recommended and hope to one day come to your farm. Can I plant flowers seeds on the top of fabric? You’ll want to burn holes in the fabric and plant the seeds into the dirt. The roots of the flowers won’t grow through the fabric, so planting them into the dirt is best. Are the holes in your dahlia spacer jig also 2.5”? They look larger, but I can’t tell. Thank you for all the amazing info. Hi such a useful article , what diameter are the holes that you burn ? The holes are 2.5 inches in diameter. Thank you for the great article! What size of holes do you recommend? Would 1″ holes do the trick? The holes we burn are 2.5 inches in diameter. That size seems to work best for us. Thank you for an incredibly informative post. Do you ever grow seeds directly in the holes or only put in seedlings? So glad you enjoyed the post. Sometimes we do directly plant into the landscape fabric, but most often to extend our season, we start our seeds in the greenhouse first. Thanks for asking! Thank you so much! We put up our high tunnel, 30×72 two years ago. Oh my! I grew so many weeds. It was awful. I’ve been gardening for so long and that was horrendous to keep up with. I just ordered my Landscape fabric after reading this post. I blog too, and your blog was very clear and informative, unlike so many. Thank you! This article easy to understand and help to stop weed very effectively. I really follow your idea. Your image gallery is so nice. Thanks for this content. Have you ever had the need to clean the fabric due to pests or other problems? Any recommendations on doing so? I’m interested in a cutting garden for household use, and will adapt a lot of this information! Thank you. We have isolated spots that get good sun in the summer, some of them invaded with comfrey. I’m hoping that by digging up the roots as much as possible (always miss little pieces, right? ), and then using landscape cloth, I’ll suppress the stuff. Right now I’ve got old carpet and random pieces of plywood over them. Not lovely, and will see how effective it is. Just ordered your book through our local indie bookstore. Should be here next week. Yum. Farmer’s Friend, LLC, has started selling ground cover with mechanically preburned holes. Right now they are only offering two patterns but they are prototyping a machine that can be programmed to make any pattern. Tracy, What a great idea to double up thee fabric when burning the holes! Thank you for sharing! Looks like Farmer’s Friend is going to be offering precut landscape fabric very soon! Floret, do you use the landscape fabric for your Dahlias? Outstanding information. Thank you so much for sharing your wealth of knowledge! I just want to say that I appreciate this blog entry, with all the clear pics and descriptions. I’ve amended the soil, rototilled it, got the sheet metal templates and cut it, got the landscape fabric for burning the holes and have seed on the go. This information has been invaluable and I look forward to purchasing the book soon. Thank you so much for posting this article! A great read! Thank you so much for posting this article. A great read! Thank you for posting this article! I was in the middle of laying down my landscape fabric when my staples and irrigation supplies arrived in the mail. I was trying to get as much done as I could because the temps were going to drop from 65 to 33 degrees by late evening. Typical Ohio weather nowadays! Anyway in the rush of having only a couple of hours left to work, I almost uncovered the beds to put the irrigation tape down, but then realized I hadn’t bought my weeding torch yet and needed to burn the holes first (and of course, not in the hose too). The tape would have to wait. The dreaded feeling of measuring all those hoses came to mind and the thought of how long that would take. So thank you! I jumped up and down when I saw your template and I also have a small torch! What a time saver! Love this post! How do you manually weed once the landscape fabric is down? Do the weeds poke through, or do you lift the material up and weed underneath it? Be sure to get landscape fabric with finished edges. Somehow in my garden past I got some wother unfinished edges and I still find the unravelled strands when I dig! Grr! 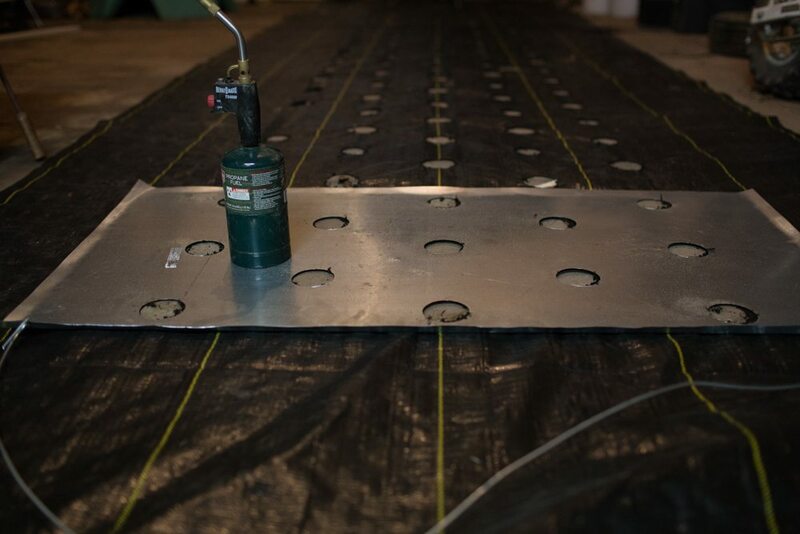 Do you use 2.5″ holes for all grid spacing? Or larger holes for the larger grid spacing? Thanks! Jenna, it is seldom that I am in such admiration of someone who strikes out there to accomplish this type of goal, but girl, I’ve got to hand it to you, you and your team have did a fabulous job. I wish you the very best in all your blooming endeavors. It looks like a thriving business!!!! I LOVE gardening, and plan to try some of your suggestions. Thank you for sharing! Looking forward to trying this with flowers and our vegetable garden. Do you use something to kill the weeds as well such as a natural weed killer? I believe I saw where you gave a list of which flower varieties get which spacing. Could you share this. Hi! I love reading through your posts. I live in a really cold climate and want to try this landscape fabric in hopes that it will warm up my soil a little. I’m wondering if it will still work if I don’t have a dripper system? How do you hold up the the flower netting? Simple bamboo stakes? Thank you for sharing all of your hard earned knowledge!!! I am just soaking it in and dreaming big dreams , got babies at home so it will have to be slow and simple for now. Just came across your blog and just love everything about it!? Have you tired to use the same plastic a second year? We use Punch N Plant Weed block which is a newer? 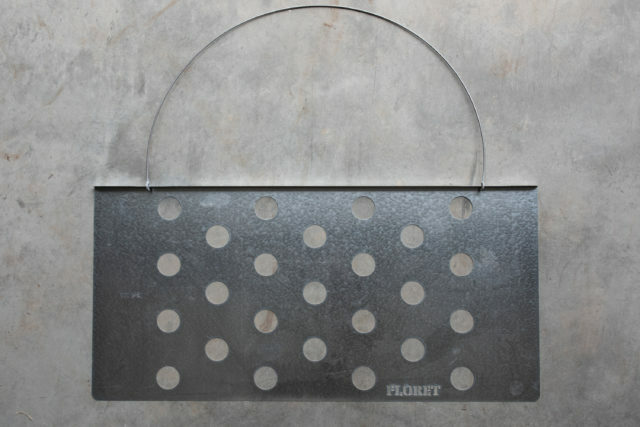 product I found online which has the holes pre-perforated in landscape fabric where you can choose which ones to punch out and use. It worked great for us this year. I contacted them and they can do larger rolls than the ones they sell in stores as well. Do you ever have problems with rodents chewing through your drip tape and struggling to fix it through the fabric? If so, any solutions? for either rodents under the fabric or having to fix drip tape holes. I’m wondering how you fix the drip lines if they ever blow out or get clogged. I imagine it would be difficult while they are under the fabric. Success!! We doubled our 28 metre lengths of Landscape Fabric ,and then used our homemade metal Template / Burner ,to burn Two Holes at a time. We then pulled apart and wham a single legnth ready to go down on Drip Tape. Thankyou Floret for All your help. Erin, with the length of your rows, you said I think 70 feet, how do you work the length of these at 300 feet. Do you cut the mats at the desired length to cover your 70 foot rows, I assume a bit extra at each end? I can’t see you not cutting them to fit you plots, but I thought I’d ask. Thanks about showing how easy it can be to burn the pattern into the cover. Thank you for sharing this. 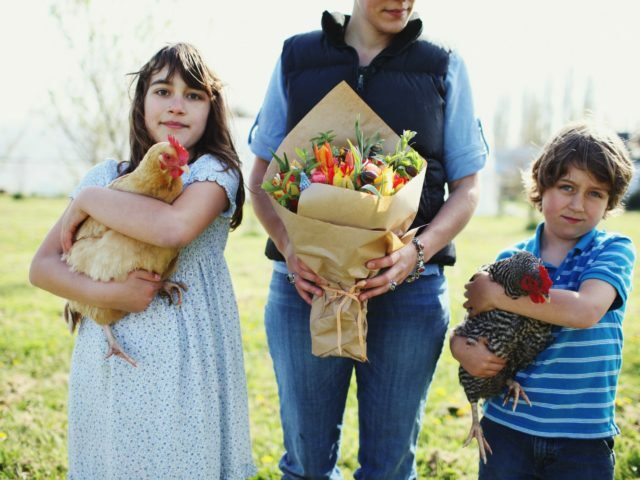 Will definitely give it a try when we have our own farm. So helpful! Why avoid the landscape fabric with fuzzy underside? 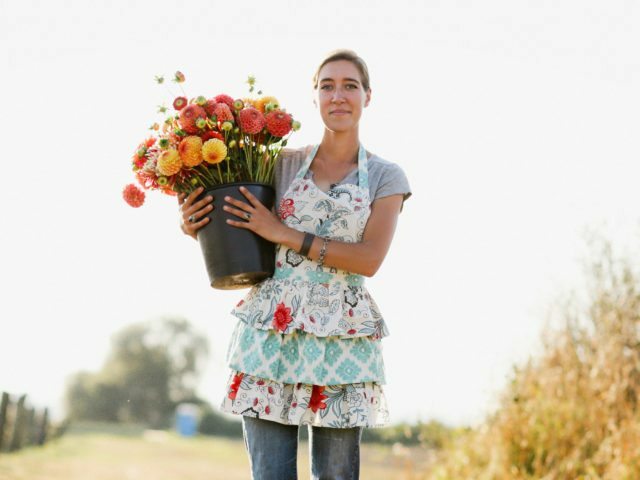 Hi Erin, I just discovered you and floret Floret flowers. Thankyou for all of the inspiring advice you provide. I am an aspiring and budding farmer of flowers, but specifically peonies. My collection is growing and maturing. I know you mention them in your posts, pictures, and bouquets. If you’d be willing to share a little info on how you lay out you beds, landscape fabric, etc, I would love to hear. Thankyou for all the information you share! Great post! I second the questions about dahlias and gophers. Would love to be weed-free in my u pick! Just burned our first holes today and they turned out great! Thanks for the detailed instructions. Husband just finished burning the weed fabric and it turned out beautifully. He made a template with plywood that worked fine. The landscape fabric burned without doing any damage to the plywood. Laying the drip lines and tagging down next week. Thank you so much for your amazing posts. We very nearly copied your ideas with the 9 ” spacing and it has turned out very nearly perfect. THANK YOU ERIN!! Erin this was super, super helpful. Thanks!! Really! this sounds like a miracle product even for my small home veggie and flower garden! I’m definitely trying it this year. Thanks for the resources to purchase and your recommended spacing. Very useful. I am just starting out and feel so overwhelmed at times; however, your blog posts serve to calm the anxiety with step by step, very concrete actions to take. Thank you for the enormous amount of time you’ve put into this. I appreciate every word and photo! 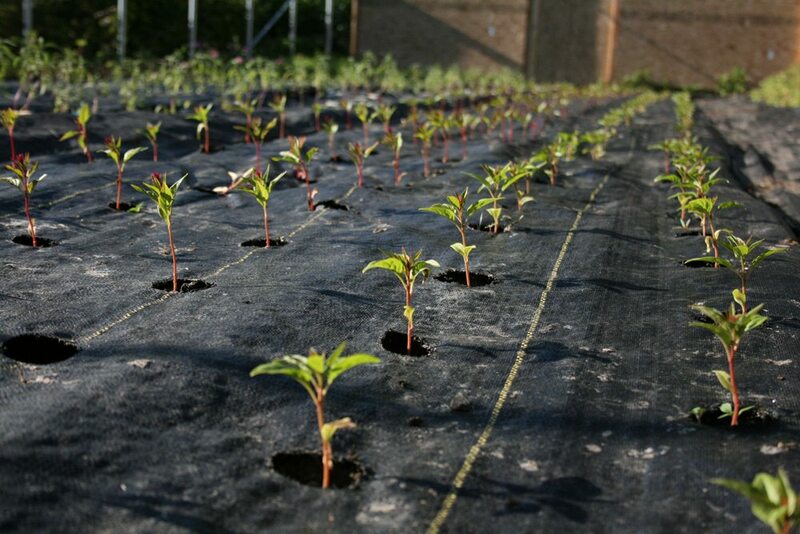 Question – So how about if you are using the landscape fabric in your garden to plant pre-started plants in. Do you do the same procedure but dig a hole for the plant in the burnt opening? I am interested, how does seed collecting work. How close can be cultivars of same flower to keep their characteristic and not to mingle together? I would like to keep seeds from this season crop for the next one…what should I do or avoid? Direct sowing – how does it actually works?How do you do it?When direct sowing, should I transplant the seedlings then to proper spacing or use only thinnig them up? Thank you so much for sharing this flurry of information, what a gift to give the knowledge that was so difficult (and expensive) to attain yourself! I’m having a lot of trouble finding Sunbelt fabric out here in NH and hope that Johnny’s would be my answer, but they don’t carry it either! There’s a Dewitt brand called Pro 5 that they carry, but it doesn’t appear to be as smooth as that which you have pictured. We were able to find the DeWitt Sunbelt 6’x300′ shipped direct from the manufacturer through the Northern Tool online store. Awesome post! So excited, I’ve got 15 rolls of 6′ x 300′ Sunbelt delivering in two weeks! Can’t believe I ever farmed without. Thank you Erin, for all that you share, you’re the best! Thank you, thank you, thank you Erin! This blog has answered all the remaining questions I had about buying and prepping the landscape fabric. My little urban flower farm will be planted on a much smaller scale starting this year with 12 3′ x 10′ beds but essentially the process is the same. In addition I have several other established beds where I will be planting out the early birds; hardy annuals, anemone, ranunculus and sweet peas and of course my fall planting of spring bulbs. Your advice is golden and I am so looking forward to the growing season ahead! Such HELPFUL information! Thank you for all the blog posts. I feel like I am drinking from a fire hose, & my “to do” list is growing. I’m thankful for your experienced & detailed advice, it will save me so much time!!! I’ve always wanted to buy a torch! There were a few questions about rodents. I’d like to know, too, what you do to deter them. I use traps, but I still don’t get them all. When I lived in the city (read 7000 sq. ft. lot) & had moles I made a garlic/castor oil/dish soap concoction. I put it in a Blendtec with water & made a nice liquid out of it. I then put it in a garden sprayer that attached to my hose & sprayed it on my lawn & flower beds. I didn’t want to use it on the vegetable garden that we would eat vegetables from. The solution coats the worms & grubs, & the moles don’t like the taste of them, so leave. It worked, & I may try this again; even though I have a bigger space. I would like to know if you use the cloth with dahlias, & also, if you use the fabric with perennials. I’ve been wanting to start a peony patch. I’ve been loving all your posts! Thank you, Erin, for all of this information. I will definitely invest in good-quality landscape fabric. I have used “fabric” in the past, but it always falls apart and is certainly not reusable. Last year, I totally lost the battle with the weeds. Not this year!!! Thanks Erin, very precious information as always!!!! I have a question, for wich flowers you DON’T use landscape fabric? Erin, thank you so much for sharing all of your hard earned wisdom! May I ask why not to use the fabric that is fuzzy on one side? Hi! Thank you so much for sharing all your hard earned information! The pictures are great and really help me to get a real idea of what I want to do and form the picture in my head! Awesome! A random thought as I looked at all that fabric and how much land it covered; have you ever had any critters (ie. snakes) harass you from beneath the fabric? I know, far out, or maybe not, haha! thanks much again! Best! Awesome post Erin! I used fabric last year but this year I am going to use it even more and do some areas all fabric (dahlias), just picked up a 300′ roll and may get another. Our PA weeds are CRAZY. Question–you said you use the tractor bucket to pull up the fabric at the end of the season, do you pull the staples out with it, do they come out attached to the fabric or do you have to go through by hand? Sometimes our staples don’t come out with the fabric which makes it a manual process. Any tips? Once it’s up do you just work together to fold it or how do you store? Thank you so much!!! I just emailed the link to this article to my husband. Now we can begin in earnest to start preparing to plant at the end of March. I like others went looking for this info and couldn’t find it, but I didn’t panic because I knew this would be included in the February blizzard. The added info is incredibly helpful. I went to the county Ag center yesterday and got boxes for soil testing. It’s only $4.00 a sample during there busy months (December-March) of course. But free during the rest of the year. I’m starting late but should get results back within two weeks. Just need to let the ground dry a little from all the rain lately. Getting very excited, love the anticipation of new beginnings!!! This was super helpful, I’ve started gathering my supplies and I’ll be giving this a shot in my backyard gardens this year. Erin, thank you so much for these posts, they are so generous! I would also love to hear more about what you recommend for drip irrigation. Your insight is wonderful! Wow! Thank you soooooo much. Looking into this now. We are always so innundated with weeds here in Georgia. Really looking forward to this information about the “tea”. As always, I am so thankful for all the details you so freely shower upon us. Thank you doesn’t seem to cover how I really feel, but it’s all I have. I will need this probably next year. After you said you couldn’t find one with holes, I started searching. I did Find something called a garden mat with premade holes. They also sell commercial sized rolls. I’m going to look into it! http://gardenmats.com. Thanks again for sharing all of this info! I included a list of the seeds I’m buying from you in my latest blog post!! Awesome thank you for this. Could you tell us also is this a 3.2 oz fabric or 4.1 oz. ? Thanks!! This is super helpful! I’d love, love, love to see a post on disease and pest control. Fantastic! Love the sheet metal template. I’ve seen others use a flame weeder, which is probably what I’ll do this year – you just set it right down onto the fabric and it cuts through. Some folks do the burning right on top of the soil with the fabric already pinned down. FYI, I bought some of the Pro-5 fabric from Johnny’s and had to return it because it was the fuzzy kind! It cost a lot to return, so call and make sure before you buy. Thanks Erin & team! Thank you so much for all the details. That’s exactly what I’ve been needing! Thank you Erin. Loving this blog blizzard!! Showed the template to burn the fabric to the hubby and he is on it!! Happen to have the fabric just needed the extra insight. Thank you so much. Thanks so much for this amazing post Erin! Two questions, what are the lines drawn on the fabric for, and do your irrigation lines go in-between the burned holes in the fabric? Looking forward to trying out this method this year! You are seriously getting me pummped for the spring! I really liked this post. Any help keeping weeds in check is so helpful. I especially liked the template making directions to burn holes in fabric. As always thank you for the lovely post, this one will make life easier this year!!! ??? Sure wish I had known about burning the holes when I was growing Lavender. Not only did we cut ours, which caused it to fray, I purchased 6 foot wide rolls (all I could find at the time) and cut it in to 2 foot widths so the edges were frayed as well. We have a terrible time with moles and they wreaked havoc on the landscape fabric and the worst part is that the birds picked up the frayed threads and used them for their nests. We have found tiny babies dead in their nests because they were caught in the threads and have rescued a couple on the ground who couldn’t fly as their legs were wrapped by the plastic threads. Needless to say all of the landscape fabric is rolled up and inside our barn where the birds can’t have access to it. By all means spend the money to buy the “hole burner” (It works for weeds too when used on gravel or hardscape). Although that being said about using it for burning weeds, someone in England set his neighbors yard and gardens on fire using the “burning” method for killing weeds. Oops! Wow! Thank so much for sharing. I really appreciate your valuable information. I am based in South Africa and used these sheets with great success during spring and early summer. I find that when it gets too hot ( we had an extremely hot summer 38 – 41degreesC) it attracts too much heat – even under shade cloth. I used your idea for hoop houses and covered it with 40% shade cloth for the extreme summer periods. So far so good. Will keep you posted. Keep up the good work. I love being part of this flower community! Another great post! I’m glad you included pictures of the grid. I’m doing this for my garden this year and I don’t think my husband quite understood how I explained it to him, so it’s easy peasy for me to show him this blog post. It’s funny how I explain things to him…. “Erin does this” and “Erin does that”. The people at my local garden supply store hadn’t heard of burning the holes either…..thanks! Lol! I just did this with my husband 5 minutes ago. I talk of Erin as if she and I hang out each day. I really love these posts, Erin. So full of valuable information. Do you use fabric on your perennial plantings aswell? What about biennials? I’m a bit concerned about making hiding places for mice and voles… Are there any annuals you don’t plant in fabric? If so, for what reason? And a different thing; the low tunnels on the top pic, how do you stop them from blowing away? Just spent a late night pinning down fabric with blocks and pallets… Thanks for sharing, it is much appreciated! Yay!! Another extremely timely post!! This information is invaluable and the best part to me is you including your brands that you use and where to get them!!! Thank you for your generosity and all the work and thought that goes into these posts. PLEASE keep them coming. Maybe one on watering? Especially on the drip irrigation, where you get your supplies, what you use, how often you turn it on, how long you leave it on, how you make your compost tea, how frequently your spray it. Much love from East TN. Oxoo! Thank you again. Following your instructions from previous posts got me using lanscape fabric for most of my flowers last year, which was my first. Thank goodness. The sheet metal template with the wire pull will be this year’s addition, as well as more than 9×9 spacing. Hopefully I’ll get the whole thing (almost) covered. The information you give so freely to all of us is invaluable. I get so excited and happy reading it all. Thank you. I dont know how much time I spent over the last week trying to find your post on Landscape Fabric, so thank you SO MUCH for this updated version! Do you use fabric for dahlias, or are they big enough that the weeds are quite a competition? I want to know the answer to this too! Thank you , very interesting and inspiring! I hav read “compost tea” a couple kf times now in your posts. Are you going to focus on that soon? Do you have gophers? I am so hesitant to use this because it would be hard to trap. Perhaps I’ll invest in a small amount and use on plants I know they don’t love. Such a lovely article! I cannot wait to tackle this project, (on a smaller scale), hopefully this weekend! Thank you for your thoughtful post, detailed outline, and genuine love of flowers. Your blog is the sweetest gift! I won’t be getting an this year – not enough space to justify the cost – but this is a great resource! And it reminded me I do need netting because wind. As always such great info! Thanks so much for sharing your expertise, time, and energy. 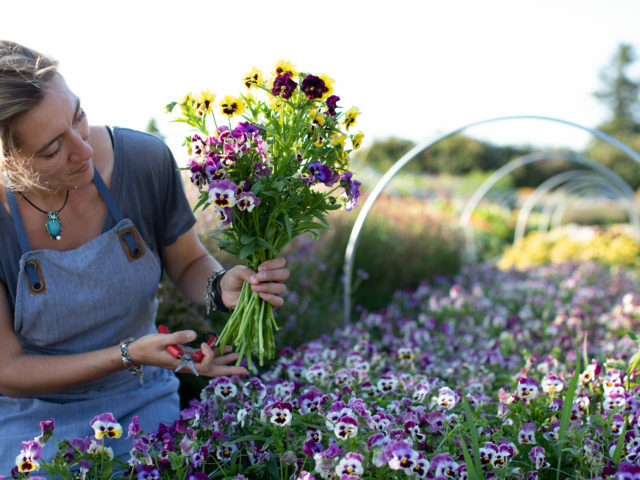 I’m relatively new to your blog so I can go back and read your previous posts as my nighttime reading….and drift off to sleep with dreams of all the beautiful blooms to appear on our little half acre farm. ??? Sublime, just so simple and yet so easy to recreate. I can see I have my work cut out for me in the next few weeks, goodness so much to learn and it feels that the clock is already ticking down! Thanks for sharing….I know we were all waiting for this! I near panicked when I couldn’t find your blog post about burning landscape fabric a couple weeks ago! Thanks so much for putting it back up. I feel so daunted by it having never used it before but the idea of wedding again like last year is my worst nightmare. Time to take the plunge. Do you use the landscape fabric for dahlias? Thanks a bajillion for sharing! Wow, thank you for this. Weeds are always the end to my spring time excitement. Are there some things you grow without this fabric because they do better for some reason? Another question I am hoping you answer in this series (which I am loving) is how you handle perennials. Do you rip them out and treat them as annuals. And which ones are your favorite if we plan to keep them from season to season? Thank you! I have been looking at this product for the past few years wondering if it was really worth it I know the weed fabrics are a joke and I’ve tried plastic but it doesn’t last and it doesn’t allow water to go through so last year I tore it all up and I am going to invest the money into this stuff!! Thanks for reaffirming my research!! We use a plywood template and a weed burner with a 2″ nozzle for most of our planting holes. Any that we need bigger than that we use a blowtorch like you do, attached to a big-ol can of propane that we lug around. You’d think the plywood would get burned, but it doesn’t really. Thanks for your work and recommendation of landscape fabric. It’s saved us tons of work at the outset.